In India we have several centers where we take care of over 200 children in different centers who are physically handicapped, mentally challenged, poor and orphaned. The Divine Providence Home for the Handicapped Boys is an ideal Rehabilitation Centre. This was founded by late Fr. Mario Fumagally, an Italian priest, about 44 years ago and now it is an entrusted to CFIC. 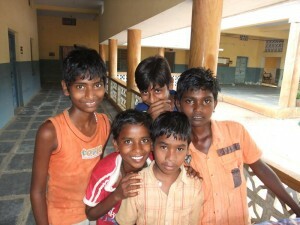 These children are collected from the poor villages of the Province of Andhra Pradesh . Because of the poverty in the family and the lack of knowledge of the disabilities they are rejected and left in the villages. Very often they are left alone in the village corner. They have no chance to go to school and not even of getting a primary education. Thought they are physically disabled many of them re intellectually smart and very good in studies, when we give the proper training and care to them. Ananda Bhavan (house of joy) is a residential school for the mentally disabled children started on 17th June 1997 under the initiative of CFIC for the integral development of the mentally challenged children. At present the school has the strength of 60 students and eleven trained staff. The aim of the school is to provide individual care, affection, education and training for the integral growth of the children. For this purpose we start vocational training which consists of various activities like stitching, chalk making, book binding, craft work and gardening. 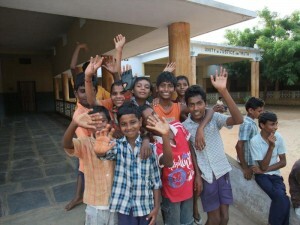 Sneha Sadan (Home of Love), a home for poor and abandoned children was started in 1996 by CFIC. At present there are 32 such children. We assist them in their material, intellectual and spiritual needs. We teach them not only how to earn an honest livelihood but also how to live as better human persons. As a result the social responsibility is very high, moral state is much stronger and their human concern is very appreciable. This centre was started for Tsunami affected areas of the Province of Tamilnadu in 2006. It is in the initial stage and we are unable to meet the needs of the Tsunami affected children. At present we offer our service to 26 children per day. We help through the therapies to overcome the disabilities caused by Tsunami with the collaboration of many generous persons. Your generous contributions and support effect tremendous changes in the life of these children. Through all that you do towards this mission, you are helping to make a better life possible for these children.